How to Tell If Your Contact Is Torn? 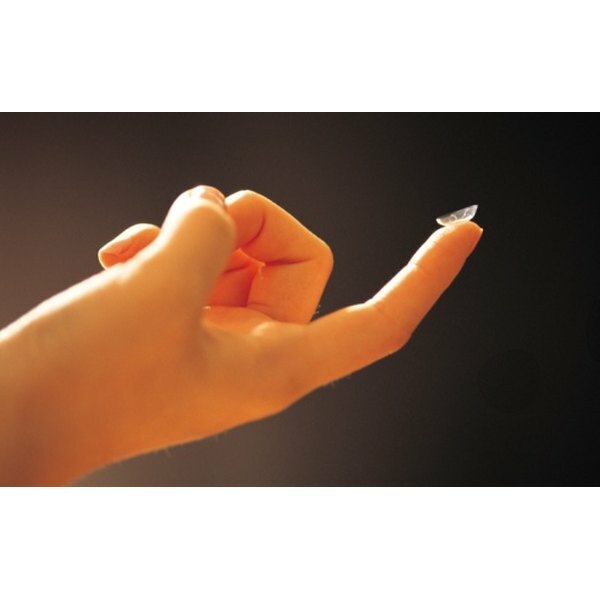 Contact lenses, used to correct your vision, may take some time and effort to adjust to. After you learn the techniques for inserting and removing the lenses -- and caring for the lenses to keep them clean and moist -- you may enjoy the freedom from wearing glasses. With careful examination, you can tell if your contact is torn. Because a torn lens can damage your eye, always inspect your contacts before you insert them. Wash your hands with soap and water before handling your contact lenses. Dry your hands with a clean towel. Open the contact case and remove a contact lens by picking it up with your clean fingers. Hold the contact lens on the tip of your index finger under bright lighting conditions. Inspect the contact lens for damage and tearing. Examine the edges of the contact to ensure that the edge appears smooth without any uneven or jagged areas. If you find any areas of your contact that appear rough, discard the contact. Place the contact in your eye. Assess how the contact feels in your eye. If the contact feels uncomfortable or if it hurts, remove it and examine it again for damage. An intact contact lens without tears or damage should feel comfortable in your eye. Any signs of discomfort while wearing a contact lens may indicate damage. Even if you cannot detect a tear, stop wearing a contact that feels uncomfortable. If your contact is still within the manufacturer’s recommended wearing time period, many manufacturers will replace a damaged contact without charge.